The SafeFamilyLife™ Ultimate Vehicle Safety Kit is specifically structured to make the time you spend in your vehicle safer. From your vehicle auto emergency tool, to a diversion safe for your valuables, to your personal safety with pepper spray, to helping you stay awake on long drives with the nap alarm. Plus a manual with instructions for each product in the kit and a DVD that demonstrates each product for you. These reports are designed with your safety and security in mind while you are traveling in your vehicle and are a great resource for staying safe in your car, truck or RV. 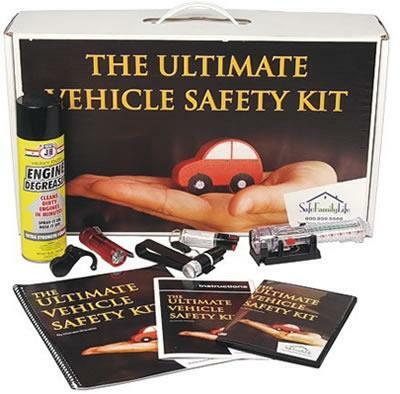 Below is a video that shows you each product in the "Ultimate Vehicle Safety Kit"